Thank you for joining us today for a very interesting technical product review. We have a unique twist on the technology equipment that we evaluate, with the specific product we are reviewing, which is the Epson FastFoto FF-640 Scanner. Just some background on this Scanner; it is a fit for not only home office use, but it's also quite useful for the home, as well. Today, we are going to take a look at the FastFoto in terms of the set-up of the scanner, the speed of the actual scanning process, the quality of the scan results, as well as some features and options that I found quite helpful, and you might, as well. Straight out of the box, the scanner looks non-threatening, and if I had to compare it, I would say it's about the size of a toaster oven. The only thing that you have to do is just snap in the Automatic Document Feeder (ADF), which is quite simple. Aside from that, the scanner is pretty much turn-key and ready for the software, which is the last step in the set-up. This part is a snap! 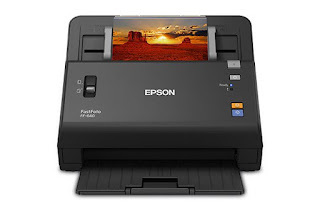 Super-easy, since you download the software directly via Epson's website. I call it "seamless" since it is so easy. I suggest you download all software offered to you for your given operating system. It's free to download and it will help you take further advantage of the functionality of the scanner. Guess What? Congratulations! Your Scanner is now configured and ready to begin scanning! At this point, your scanner is all set up, with software installed, the USB cable connected to your laptop or desktop, and now you're ready to begin using it. As easy as the scanner is to get set up, it's even easier to use! What I have tested the scanner with was 5 different items; regular photos, Polaroid photos, documents, business cards, and for my own purposes, baseball cards. Automatic folders are set up for you and you name them at the moment right before they actually scan. One amazing feature of this scanner that will "WOW" most folks is that it automatically scans front and back, so if you have handwriting or something on the back of a document or photo that is important to save, it will also scan that as well. The FastFoto will name the front file name with an "a", and the file name for the back will have a "b". Not only does it capture the names, but it also captures the date as well for easier filing and for ease in locating the files long after you have finished scanning. Another thing that makes this real easy is the Automatic Document Feeder (ADF), which you really cannot do without it. It is a critical part of the scanner. Example: I was trying to send some Polaroids through and they were not going through at first but then I resolved it by just placing them in a different way on the feeder, which is very versatile in this specialized type of scanner. On the topic of ease, you can even have the photos border adjusted by simply tweaking the settings, and it even allows you to take out red eyes if they show up in the scan. As for resolution,the FastFoto defaults to 300 DPI resolution but it also has an option for 600 DPI, but remember, and this goes for all Scanners; as you go up in resolution, the time it takes to scan your items will increase, as well. Speed is another great quality of this scanner. I sent through 20 photos and they were done in about 50 seconds which is blazing fast. The amount of time that it saves you will really impress you! Sometimes, you have to go back and adjust the photos or anything that you've scanned in order to tweak it and make it better, especially if it's a faded out photo; this will correct it. For those folks that scan often and then have to correct the documents or photos, etc afterward, will realize that this is a huge time saver. Just think of how much you will miss Photoshop editing your scanned image files. This might make you tear up over that... or perhaps they are tears of joy? Perhaps both? Overall it's amazing how accurate the FastFoto is, and that just goes to show you the quality of product that Epson once again has put out on the market. As I mentioned above, the quality is second to none. One of the many features that makes this scanner shine is the auto enhancement, which really does some magical things when you're dealing with photos that are either faded or just very very light, i.e. with sun in the photo, or something bright along those lines. As mentioned, you can select the enhancement option in the settings by changing it to be Automatic, or you can manually do it in the folder that pops up with the app. Just select the image, click on Edit, and you can do many things to enhance your photos. Yet another great feature of the scanner is that you are able to select whether you want to save the enhanced photo as an original or if you want to make a second copy so you don't overwrite the original, in case you need to make additional changes, from the original version forward. This increases the efficiency and the amount of time saved and headaches saved with the scanner and its accompanying software. I ran into an issue with some baseball cards that would not get a reverse scan. I very easily found out through the intuitive menu that by adjusting the sensitivity settings, the lightness and darkness of writing on the back of the card, completely remedied this and fixed the issue. Any issues you come up with are easily remedied most often by looking in the settings in the software. It's true...it's all right there. I tried another scan test where I loaded up many different photos of different sizes and it scanned all of them seamlessly without even a hint of a "misfeed"! All the while, this scanner is so quiet that you don't even realize that it's working until your originals come out into the front catch. Quiet scanning is perfect in my book! To sum everything up here, this is an incredibly fast, very smart device with very good software for the user interface and it also is amazing in terms of how you are able to easily edit and enhance photos, either automatically or manually. This is a scanner that can be used to blow through hundreds or thousands of photos that you may have from years back, and catalog them for your family or yourself. Can you imagine a flood or fire and you lose all of those memories? Wouldn't it be advantageous to use the scanner to make a backup, digitally, of all of these treasures? With the option to upload everything to the cloud, you have basically an off-site private copy of all of your precious memories. This will ensure your photos will survive any adverse or damaging conditions that could affect your family photos from years past, because they are saved as your very own personal off-site high-quality front and back scans. The FastFoto makes sense on a number of levels, and it is certainly something you want to take a look at further after reading this review, so you can take the first step towards owning this time saving wonder! Hope you're having a peaceful week. 2011 is just a few days away. Doesn't 2011 sound like such a futuristic year? Well, today, I would like to share a post that was written by Bob Corcoran, titled, "Five Tips to Sell REO Properties Faster", and the reason that I am sharing this with you is that this post goes hand-in-hand with my post of November 26th, which is titled, "Post-Foreclosure REO Property Maintenance". Corcoran's post looks at how to prepare an REO for sale from a Realtors point of view, but is also applicable to investors or any other parties. 1. Be a cleaner: Corcoran emphasizes that you, "have to be willing to do what it takes to get the house sold." 2. Think colors: Corcoran states that, "Red says to stop and yellow adds a warmth and coziness." 3. Add smells: "If it smells like bad, it doesn’t matter what it looks like. ", says Corcoran, who suggests using air fresheners and a fresh pot of coffee. He says that, "The smell of coffee imparts the best of emotions. It tells people this is a good place to raise kids, it gives a warm and a comforting feeling." 4. Put up signs: Corcoran says that when you're marketing an REO property, "you need to make sure that it’s depersonalized and use cue cards – white piece of paper on the wall – that explain to prospective buyers the positives on what’s been done to the property." 5. Communicate often and regularly: This tip refers to the relationship between the bank and the Realtor, and Corcoran advises that, "When banks assign the Realtor to a property, it expects them to become the eyes and ears for everything that has to do with that property." These are some fantastic tips, and are of great use to the entire Real Estate community. Now, on to Part 2 of this post: The S&P/Case-Shiller Home Price Indices were released yesterday, and as per the report, "Six markets – Atlanta, Charlotte, Miami, Portland (OR), Seattle and Tampa – hit their lowest levels since home prices started to fall in 2006 and 2007". Bright Side? It looks like the major cities in California bounced back. Do you live in California? If so, this might make you happy? Thanks for hearing me out! Comments? Questions? Suggestions? You have tons of options for feedback here. Happy mid-week to all of you. Just a few more days, and it will be my birthday (Halloween). Please don't ask how old I am, will be, or if my face is a permanent Halloween mask...I've been down that road before ! Today, we will be taking a look at some of the best pieces of advice for people selling their home as a "For Sale By Owner" (FSBO). Based on a wide variety of discussions, we have rounded out 5 of the main topics of advice for "Fizbers": Legal Concerns, Preparation of the Home, Mechanics of the Sale, Addressing Security Concerns, and Marketing the Home. "If they simply refuse to list with a professional, they must know the facts and legal requirements", advises Wendy Hooper, a Realtor in Orange County California, who says that it is important to, "Download as much information from the State Dept of Real Estate as they can get their hands on and use the correct forms". Patrick E. Hudson, an attorney specializing in Commercial Real Estate Law, concurs, and adds that it is important to, "Know your State's disclosure laws to avoid litigation over the property condition". Preparing your home for sale is also quite important, as you can imagine. Tom Wright, who was a builder and home flipper for 30 years, advises that you need to clean up the home, rake the leaves, and clean up the lawn, in order to, "Make sure the first impression is a good one". Wendy Hooper suggests that you, "Stage the home like a new model home", and that you should visit some model homes for examples. Wright adds that on walk through days, you should, "bake some bread". Your game plan is almost as important as the sale itself, and these "Mechanics of Selling" the home are the keys to your success. Patrick E. Hudson suggests that you know what you are willing to pay a buyer's broker, and also, where you will go once you have a willing buyer. Along the same theme of pricing, Hooper suggests that you, "Visit the local "competition" and price the home accordingly. Homes priced correctly WILL sell". A huge part of the mechanics of selling your home FSBO is actually showing the home. Hooper tells us that you need to make sure the home, "is available to see with as little notice as possible", since, "Buyers are fickle and won't wait around until it's convenient for Sellers to let them inside. They'll move on and buy the home that was easiest for them to see according to their schedule". Tom Shipley, a homeowner/homebuyer, says that, "it makes prospective buyers very uncomfortable to tour a house in front of the owner. ", and that you should, "ask a trusted friend or even hire someone else and make sure they go out of their way to mention they are not the owner.". The advantage to this is that, "people will spend more time looking at your house and imagining themselves living there. ", but, "If you don't have somebody to help you, make sure you don't follow the buyers around.". As part of selling your home, you are opening your doors to complete strangers, and this could be an invitation to trouble, so addressing the security concerns is well-warranted. Lydia Player, a Realtor, says that, "A "For-Sale-By-Owner" sign is an invitation to strangers to wander through your home". Player cites many scams, where the visitor asks if you have a security system, one where they go to your bathroom and look for the prescription drugs, and one where they take photos for a "spouse who is out of town", with the photos helping them "case" the layout of your home. 1. Make all of your showing by appointment only (get a name and number and call back to verify them). 2. Don't be home alone when a stranger visits. 3. Have visitors sign a guest book and ask to see identification, and put the information in a safe place. 4. Place all valuables out of sight, including prescription drugs. 5. Eliminate displays of personal information, such as which schools children attend. 6. Never leave a messages informing callers that you are not home. Don't let strangers know your schedule. 7. Request that visitors enter and exit through one door only. Have quick and easy access to all of your exits. 8. Never leave a stranger alone and watch everything they do while in your house. 9. Do not put information on flyers which would compromise security. Finally, in marketing your home, Hudson suggests that to increase exposure, "get the house listed on MLS, using a friend or paying a fee". Kenny Jahng, a small biz and web consultant, suggests that you, "Create a website with a virtual tour, tons of photos and contact form using the street name in the actual URL.". Additionally, if you are also looking to entertain a Rent to Own/Lease Option arrangement, you can list your home on our website (http://www.lease2buy.com/prospectivesellers.php). Hopefully, these tips will serve as a great help for you in selling your home "For Sale By Owner" (FSBO), and remember, there are tons of fantastic and hard-working Realtors and Agents out there, should you decide you do not want to do it alone. As always, we welcome your comments. Hope you have had a great week, and the Memorial Day Weekend is upon us. Literally...it's hours away ! 5. Amount of traffic in (1-mile) perimeter around the home. If you are all thinking the same thing I am, it is amazing that the majority is primarily concerned with being able to make the payments. I wonder if we had done the same poll 3 years ago, if the results would be different? We can only wonder. Incidentally, take note of #3 ("Proximity to Family") - my Mother-in-Law lives overseas - so I am living outside that particular rule (wonderful lady - but space is good, universally). We will try to make at least 1 or more Podcasts per week, coupled with our 3 +/- Blog Posts per week. A few reminders: We offer very generous referral fees (contact us here for more information). Also, the Pending Home Sales index will be released next Wednesday, June 2nd, and it will cover the month of April. Keep your eyes peeled for that one. May you have a fantastic Holiday Weekend. And as always, Happy Rent-to-Owning ! Hope everyone had a fantastic weekend. For those of you in the Northeast, the weather was picture perfect, and might I add....finally ! OK, down to business: We have revamped a few of the E-Books ("Secrets of Rent to Own" and "Fighting Foreclosure"), and next, we will be focusing on the Real Estate Investors guide, "Will it Work in My Town?". I came across an interesting story that I wanted to share, titles, "Return of the House Flippers", in Yahoo Finance (Located here: http://news.yahoo.com/s/bw/20100401/bs_bw/1015b4173024165587). It is quite an interesting article for those of you geared towards the investing side of Real Estate. Just to summarize, the article touches on the spark in foreclosure auctions, as well as the Federal Approvals that are involved in that sector. A very interesting, informative, and a very positive read. Be sure to check it out.